The rupicolous birds targeted by this project inhabit the rocky promontories and cliffs of the Douro River from Miranda do Douro/ Villadepera to Freixo-de-Espada-à-Cinta/ Vilvestre, and from there to Barca d’Alva/ San Martín, as well as south towards the Valley of Águeda River. The main actions of the project will take place in these areas of the International Douro River, particularly the actions concerning environmental education and artificial/ supplementary feeding. The Portuguese municipalities covered by the project are Miranda do Douro, Mogadouro, Freixo-de-Espada-à-Cinta, and Figueira de Castelo Rodrigo. In Spain includes territories in Zamora and Salamanca. 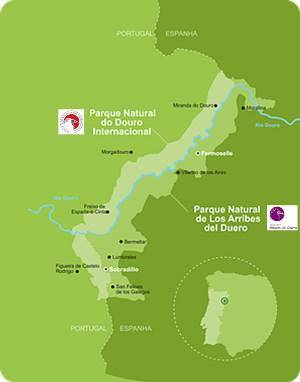 - "Douro Internacional Natural Park”. - “Arribes del Duero Natural Park”. - Natura 2000 newtork: Special Protection Area and Site of Community Importance. - Recognised by BirdLife International as International Douro River and Vale do Águeda Important Bird Area (IBA).